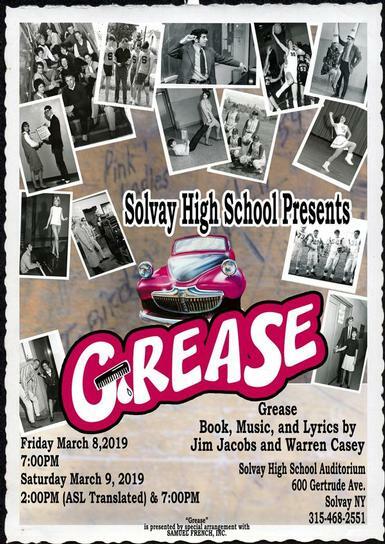 “Grease” is the word for the upcoming spring musical at Solvay High School! The Solvay High School Drama Club is pleased to present “Grease” to the Solvay community. The show will take place in the SHS Auditorium on Friday, March 8 at 7 p.m. and on Saturday, March 9 at 2 and 7 p.m. The matinee performance on Saturday, March 9 at 2 p.m. will be signed in American Sign Language. “Grease” introduces us to Rydell High's senior class of 1959. This rollicking musical brings us back to the look and sound 1950s, with the duck-tailed, hot-rodding "T-Birds" and their gum-snapping, hip-shaking "Pink Ladies" in bobby sox and pedal pushers. The musical focuses on head "greaser" Danny Zuko and new (good) girl Sandy Dumbrowski, as they try to relive the high romance of their "Summer Nights." Next to them, the rest of the gang sings and dances its way through such songs as "Greased Lightnin'," "We Go Together," and "Born to Hand-Jive," recalling the music of Buddy Holly, Little Richard, and Elvis Presley that became the soundtrack of a generation. With an eight-year run on Broadway and two subsequent revivals, along with innumerable school and community productions, “Grease” has been placed among the world's most popular musicals. “Grease” is directed by Christian (CJ) Oliver, with musical direction by Carrie Pardee and choreography by MacKenzie Gildemeyer. In addition to this, Jerry FitzGerald is the producer/pit orchestra director, Chelsea Connors is assistant to the producer/director, Kermit Buckman is the set construction, Mark Weston is lights and sound, Steve Devendorf is props and media, and Frank and Mary Beth Lopez are costumes. The “Grease” cast includes: Javen Green (Danny), Anastasia LaFlair (Sandy), Nick Lopez (Kenickie), Marisa Presutto (Rizzo), Dominick Montreal (Roger), Jianna Speach (Jan), Anthony Fritzen (Sonny), Zoe Francemone (Marty), Nick Trinca (Doody), Jenn Klix (Frenchie), Adam DeLucia (Eugene), Brianna Holtsbery (Patty Simcox), Brandon Falcone (Vince Fontaine), Mico Hayden (Johnny Casino), Ariess Battle (Teen Angel), Jessica Vale (Miss Lynch). Ensemble: Rhiannon Ackerman, Erica Bagozzi (dance captain), Zack Balduzzi, Abigail Bugbee, Alexis Chrysler, Reaghan Donigan, Matt Hayden, Isabella DeFio, Bri Kuhles, Summer Lewis (dance captain), Alyssa Long, Rachel Maloney, Tyler McCarthy, Mike McEwen, Noah Monty, Jelena Scalzo, Carissa Stachurski, and Brianna Williams. The Pit Orchestra includes: Mary Vecillo - Piano, Chris Jabot - Sax, Laura FitzGerald – Sax, Jason Mainville – Guitar, Evan Tennant, Drums. Tickets are on sale now. Presale tickets are $10 for adults and $8 for students and seniors. Tickets will also be sold at the door the day of each performance for $12 for adults and $10 for students 12 and under. Children five and under are free. Tickets can be purchased at the SHS Main Office or by phone at 315-468-2551, during school hours. We hope you will come out to support the SHS Drama Club and make the Solvay Musical a part of your tradition.